learning management software are tools that are designed for e-learning. Its goal is to enable businesses and educational institutions to administer, organize and control their learning processes. They also help prepare, distribute and monetize original and goal-centered consent. What is learning management software and how to choose a good LMS system? The LMS arena is a very diverse one, meaning that you will come across simple document management apps, but also fully-featured and scalable training & performance systems. In few words, a solid learning management software is expected to become your centralized source for educational information, from where you will create content, offer development and training to multiple beneficiaries simultaneously, organize classes, and monitor and evaluate their progress. In the ideal scenario, you will be able to adapt all modules to your needs, document and record data, and complete at least some basic administrative and accountancy tasks. The best way to understand how does a learning management software work is to preselect apps that cater to your needs, and test at least some of them until you find the perfect solution. What are examples of learning management software? 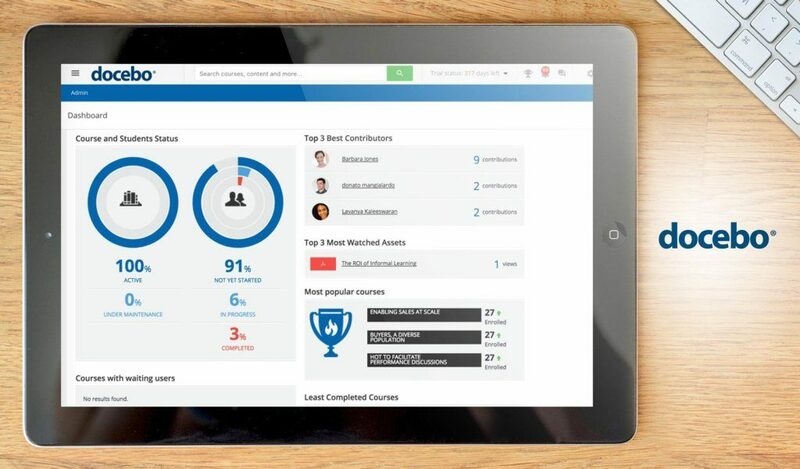 TalentLMS – A comprehensive and easy-to-use LMS suitable for business and educational usage, popular for an array of unique features such as gamification, course selling, video-conferencing, and much more. If you need a reliable TalentLMS alternative check out our other comparison articles. Docebo – One of the currently most reliable learning management solution, developed to facilitate employee training, deliver and track customizable types of eLearning activities. It is available in 30 languages, and functional on all operating systems. Litmos LMS – Salesforce partner and leader in the LMS arena, known for secure data exchange and inexpensive and dedicated corporate training. A worthwhile Docebo alternative particularly recommended to small business teams and sole coaches looking to sell content. Edmodo – Popular social learning platform for K-12 students and teachers that pays special attention to monitoring and rewarding performance. Its ease of use and gamification features make it more than welcomed in primary schools and within small learning groups. Schoology – A smart system designed for distribution of academic content, and focused on enhanced collaboration and developing quality practices both locally and globally. Looop – A robust and user-friendly learning management system (LMS) created to help you design the perfect online learning environment for your workplace. It’s a solid Litmos LMS alternative. SAF School Management Software – a comprehensive school administration software that combines learning tools and capabilities into a single package. It allows you to create and deliver positive learning experience for students, improve teaching productivity and create avenues for parents to become more engaged. Skolera ULP – a learning management and school management platform integrated into a single package. This simple and straightforward solution combines all the core capabilities of an LMS and SMS, making it easy for teachers and school administrators to deliver an enhanced learning experience for their students while being able to get families more involved with the progress of their children. Online Exam Software – Conduct Exam – a browser-based exam software that can be accessibly used by all types of learners on any device. It allows you to create various multimedia exams to make each assessment more engaging. Conduct Exam allows users to provide instantaneous test results to users immediately after the completion of each assessment, allowing you to save time and accelerate your processes. 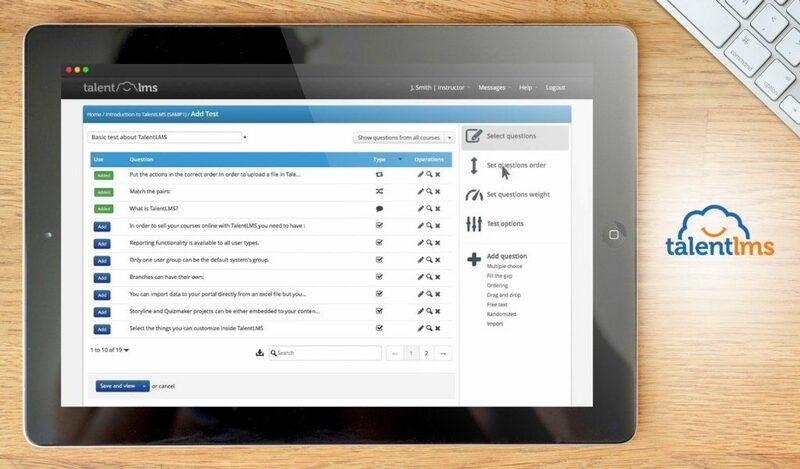 ProProfs LMS – a simple to use all-in-one learning management system designed to simplify the way companies and learning institutions conduct their training and knowledge assessment test. Among the standout features of ProProfs LMS is its user-friendly course authoring tools, which allow novices to quickly create simple and advanced online courses with ease. It also has a huge library of professionally made instructional materials and assessment tests. Why use learning management software? You’ve learned what is learning management software, but what are its uses? It is difficult to collate all benefits of a learning management software in a single post, as these systems came to be more important than anyone could have pictured at the dawn of their development. In short, LM software makes sense because it is one of the relatively few affordable types of computerized software that make blended learning possible, allowing you at the same time to prepare remote teams and to monetize your efforts regardless of where you are located. When applied in a corporate setting, LMS help turn companies into tech-savvy organizations, and use onboarding as a competitive edge that attracts (and retains) the most talented performers on the market. Last, but not least, leveraging LM technology helps develop better and more efficient practices, as you will have a detailed overview of how success-oriented your work was so far. Centralized learning management. Learning management systems bring sources, materials, learners, and coaches all under the same roof, providing them a virtual learning environment they can access regardless of their location. In such way, coaches can deliver content and evaluate performance in a more consistent manner, and design more successful training modules. Generate and distribute quality content. LMS systems come equipped with incredibly powerful course creators, where teachers and coaches can combine data from several different sources, attach media content, and engage users with feedback forms and interactive practices. Thanks to the very same system, they will be able to categorize that content in custom modules, and share it easily with large and remote groups. Teach and manage remote groups of learners. The reason why digitized learning management was saluted with all honors by the learners’ community was its power to make certified training easily accessible worldwide. Now, academics and coaches find it easy to distribute and sell content on all continents, or use a virtual classroom to train lots of international participants at once. Facilitate access to information. The majority of well-reputed LMSs are hosted in cloud, which means that data is stored on an external server and made available with nothing but internet connection. With a dedicated account, all learners will be able to download and exchange content using any of their mobile devices. Save time and money. Neat documentation and administration make learning management systems a reasonable and smart alternative to traditional classrooms and content distribution, and so does streamlined access. Now that learners don’t have to cover expensive training fees and coaches are distributing content with a single click, learning online ‘threatens’ to become the leading way of learning altogether. Automate evaluation. Learning is a competitive environment by default, which is why it is important to make this process as transparent as possible. LMSs make this happen by introducing automated evaluation mechanisms, as well as gamification features, rewards, and other incentives for learners to do the best they can. Monetize learning content. As an independent coach looking to share experience with targeted beneficiaries, you will find LM systems to be the fastest and most cost-effective gateway to profit. You can use them to prepare engaging courses, promote those via high-traffic channels, organize live sessions, and even charge/bill your customer from the very same platform. Basically, LMSs can be your private cloud office on minimal rent. Retain & manage talent in corporate environments. By default, we all associate them with schools, but the ideal settings to benefit from an LMS system is the business one. Large and established corporations run all types of in-cloud and homegrown learning platforms to train their employees on the budget, and to develop efficient onboarding practices. What are the types of learning management software? Designed for easy creation and distribution of courses, these intuitive systems offer handy text editors, multimedia boards for instant attachment, and unlimited sharing possibilities. They are also well known for the large number of import/export integrations, neat categorization & search filters, and open contribution boards for in-group editing. They are the preferred choice of coaches and agencies looking to sell courses online, but will also do a good job for teachers injecting some creativity to their work. Offered on premise or in cloud, these fully-featured learning machines do everything from vacancy distribution to recording and promoting top performers. Enterprises use them to ensure one-step access to training materials, organize online classes for remote workers, support and share a database of corporate files, or even track the progress of each employee to reward and retain talented team members. From an employee’s perspective, this means that the employer is investing in his/her skills, and uses an impartial mechanism to see what they can do. Tools for management of schools and educational institutions. These are the classic learning management platforms designed as virtual classrooms, where teaches and coaches can hold lectures on various topics, distribute content, and set up different grading mechanisms. With fancy tools such as web conferencing, quizzes, and multimedia content, these systems help turn teaching into a two-way street, and make the most of what students have to offer. What does a learning management software do? Self-registration portals. Regardless of whether you’re selling content online or wish to organize a free training session for your team, a self-service portal is needed to facilitate access for all interested learners. Without wasting time, you will get a list of interested and qualified participants and understand their background and their interests, and also allow them to have access to content without you being involved in the process. Course funnels and roadmaps. Another way in which LMSs facilitate training is with course funnels and roadmaps. They are usually designed to help learners find their way fast, and organize information in intuitive sections to help users find what they need. Course & material databases. The core idea behind developing learning management systems was to bring training materials together in a single library, and give users the unlimited possibility to access them. In the best case, your learners will have 24/7 desktop and mobile access to your library, and a collaboration panel to comment and exchange files. Online lectures and workshops. The unique thing learning management systems do is the organization of live courses and webinars for remote attendees, where they can also make a contribution and be efficiently rewarded for their performance. Storage & file exchange. Solid LMS systems rarely impose storage limitations (unless it is distributed so between users of different plans), and allow unlimited sharing and downloads without using third-party software and email services. Evaluation toolkit & Gamification. It would be completely wrong to assume that LMSs lack the human approach of grading and honoring performance, as the teacher/coach is invited to include his own grading modules,and let the system do the heavy-lifting instead. In such way, he can detect negative and positive patterns, and improve the quality of his work. Needless to say, the system will organize this data and store it for any type of reporting purposes. Customization. The ideal LMS should also be flexible and scalable, meaning that you can easily implement your usual mode of teaching and grading, and have a tool able to support sudden influx of new learners or customers for your courses. Customization will also help make content more personalized, and allow automated modifications that otherwise take days to complete. Analytics & Reporting. Not every LMS will offer an analytic module, but in case it does, look no further. This means that your course and participant records will all be gathered in a type of electronic diary, from where you can access them any time, and pull off important stats to examine the health of your teaching/learning practices. What should you consider when getting a LMS system? Course management. Get a trial or a live demo to explore the course management features, including the capacity of the creator, method of categorization, and open channels for distribution. This will be of vital importance to ensure learners get only the best content at the end of the road, and you get to reap the fruits of your hard work. Progress tracking & evaluation. An important tip when choosing LM software is to pick applications that actually track and evaluate progress, as that’s the essence of why LMSs cost more than usual document management or web conferencing apps. What matters even more is to check whether those evaluation mechanisms coincide with your line of practice. Data access. Make no compromise for unrestricted data access – Each participant you’ve empowered to access the database should be able to do so, any time he/she wants, and from any device or operating system. Same goes for you when making quick updates on the go. Ease of use. Despite of being created to facilitate learning, these systems happen to be too complex for both learners and teachers. Driven by the idea to come up with the ‘ultimate learning machine’, developers may overwhelm you with features you don’t need, so just pick an intuitive tool everyone can use. Integrations. In order to easily import/export data and share content on social media, pick a system that integrated with the main tools you’re using. In the best possible case, get an open API tool and build your custom connections. Pricing. LMS vendors charge all the way from symbolic amounts to thousands-of-dollars subscriptions, and that often has little to do with the functionality involved. Rather than going for a fancy plan just because you can, stay on the safe side and get a tool that was actually designed for your needs. Reliability of support. Support accounts for a large portion of what you’re paying to get your LMS, both when you’re using it and when you’re not. For the sake of making a smart investment, test the tech team of your vendor in advance. The cost of a learning management software system usually depends on the features it provides or the beneficiaries it targets, as there are systems where all education and nonprofit packages are offered for free, while corporate ones withstand payment. Most vendors draft separate plans for learning teams of different sizes and industries, while they are also such that consider several different criteria, and wrap up a quote once requested. Some LMS systems, nevertheless, are offered for free. Small-biz friendly: Litmos LMS is ideal for small businesses and on-budget institutions as it offers a Pro plan priced only at $4/month for up to 1000 active users. Other pricing options are available with prices depending on the number of users. Freemium systems: TalentLMS – Offers a flexible pricing scheme adjusted to teams of all sizes, with a Free plan for teams up to 5 users. Several paid plans are also offered with prices ranging from $29 to $379/month with some of them covering an unlimited number of users. Monthly, annual, and custom subscriptions: Docebo offers custom quote-based pricing with plans crafted based on your feature requirements and the number of users. Free systems: Edmodo is the perfect example of a free, yet powerful LMS developed for the needs of teachers and students, although it also offers paid packages for schools and educational institutions. Custom pricing: Schoology is a quote-priced LMS where users have to contact the vendor directly and share their details to get a personalized plan for their needs. What are the potential issues with LMS software? Limited flexibility to import/export files. The problem that may arise with importing and exporting data is that coaches rarely have a full insight on the software used by their clients. Instead of changing the system last minute, or hiring professionals to build custom integrations, make sure your future LMS has all connections you rely on in your everyday work. Limited support. Support is a wide term, so make sure you know what you’ve been offered with. With some LMSs, this will mean 24/7 live chat center and a dedicated telephone line, but with others it will be resending the same tickets and getting a response after a week. Therefore, test the team in advance, and resort to software directories and forums for first hand information. Lack of TinCan and SCORM certification. SCORM-certified LMS solutions are the best option you’ve got to reuse and protect the content currently featured in you database, so make sure your new app supports it. What are the latest LMS software trends? eCommerce features of learning management software developed for easy monetization. Although they were not specifically built to let you monetize your courses, more and more popular LMS are introducing eCommerce and marketing modules. This means that you can easily promote and sell the course you’ve created, and ideally get paid and invoice clients using the very same platform. Web conferencing. It is really difficult to imagine an LMS in 2019 without an appropriate webinar tool, as live lectures also require active participation and input from the learners. Web conferencing makes it possible to connect and teach remote teams, and even breaks the stigma of digitized learning being perceived as ‘ the less professional way’. LMS for recruitment. This is a trend that applies specifically to corporate and talent management LMSs, which are introducing modules for efficient recruitment and automated applicant evaluation. If you’re on the hiring side, you can now get yourself an LMS that preselects good candidates on your behalf, and help you develop a personal onboarding approach for each of them.